The perfect home, according to Korean contemporary artist Do Ho Suh, floats in the middle of the Pacific Ocean. 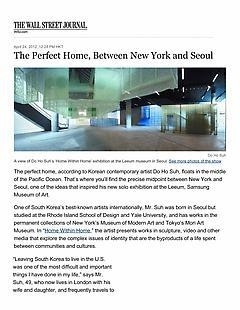 That’s where you’ll find the precise midpoint between New York and Seoul, one of the ideas that inspired his new solo exhibition at the Leeum, Samsung Museum of Art. One of South Korea’s best-known artists internationally, Mr. Suh was born in Seoul but studied at the Rhode Island School of Design and Yale University, and has works in the permanent collections of New York’s Museum of Modern Art and Tokyo’s Mori Art Museum. In “Home Within Home,” the artist presents works in sculpture, video and other media that explore the complex issues of identity that are the byproducts of a life spent between communities and cultures. On display at the Leeum is a colorful silk replica of his childhood house, a traditional dwelling called a hanok, crafted to scale and suspended in midair. Other former homes are there as well, including a New York apartment and its front stoop, and a railroad flat in Berlin. Mr. Suh recreates minute details of his living spaces like bathroom fixtures and door intercoms. Another major work is a dollhouse-sized reproduction of the Rhode Island apartment where Mr. Suh first lived as a U.S. resident. Decorated with miniature versions of household objects, from furniture to fruit, the painstakingly reproduced interior makes the exterior all the more jarring—outside, a hanok is crashed into the model’s side, a physical representation of Mr. Suh’s tumultuous adjustment from Korean to American culture. “Do Ho Suh has been a leading figure since his debut in the late 1990s, and important museums around the world have paid attention to his art,” says Hyesoo Woo, the show’s senior curator. She likens him to leading Korean-born artists such as Nam June Paik and Lee Ufan, who have also explored questions of transnational identity. On a recent visit, Mr. Suh’s works appeared to resonate with museum goers, not least because his pieces invite interaction. Walking along his diaphanous corridors and peering through his translucent fabrics reinforces the artist’s message: while a home is nominally a boundary, it is in fact a porous, changeable one.